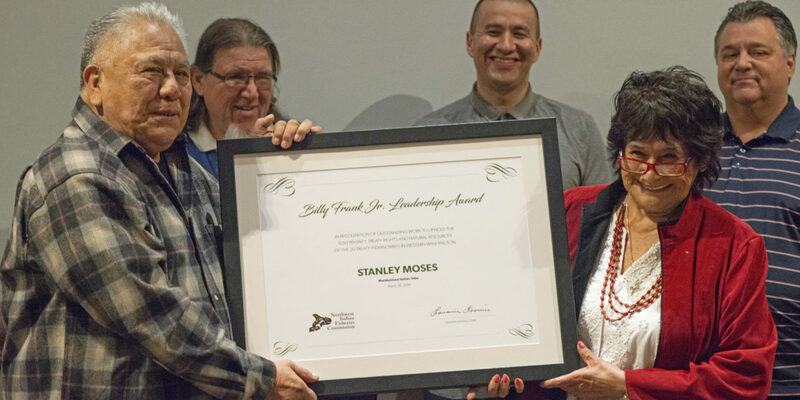 Stanley Moses, Muckleshoot Indian Fish Commission member and treaty rights activist for 50 years, was awarded the Billy Frank Jr. Leadership Award on March 28. Named for the treaty rights activist and longtime chairman of the Northwest Indian Fisheries Commission, the Billy Frank Jr. Leadership Award recognizes initiative, commitment and accomplishment in protecting tribal sovereignty and natural resources in western Washington. During the ceremony at the Muckleshoot Indian Tribe’s casino, Moses’ storied history was lauded by coworkers, attorneys and other tribal leaders. Alan Stay, Muckleshoot attorney who worked on the landmark treaty rights case, U.S. v Washington (the Boldt decision), outlined Moses’ vision, tenacity and grace. Born in 1943, Moses fought for his tribe’s fishing rights, including being arrested on the Duwamish River in the late 1960s as part of a fish-in that highlighted the treaty right. He was one of several important witnesses during the Boldt decision trial. Following the Boldt decision in 1974, Moses staffed and funded fisheries enforcement and management, as well as oversaw the development of two Muckleshoot fish hatcheries. In addition to his fish committee work, Moses served on Muckleshoot Tribal Council for 34 years beginning in the 1980s. The Muckleshoot and Suquamish tribes together successfully obtained a court injunction against an Army Corps of Engineers proposal for a 1,200-slip marina that would have taken away a treaty fishing area. The case, Muckleshoot v Hall, has been cited in 150 court cases. As part of the settlement, the two tribes established a net pen project to rear native salmon in Elliott Bay. When Moses was chairman of the tribe and the fish commission, he played a key role in obtaining a $42 million settlement with the City of Seattle on the Cedar River and a sockeye hatchery was established. Moses and the tribe successfully also fought for a decade to maintain in-stream flows in the Green River for chinook and other fish stocks with negotiations with Tacoma Public Utilities. On the White River, the tribe was involved in the regulatory process to relicense Puget Power’s dam which was ultimately abandoned, improving fish habitat and fish for the tribes that rely on them. Finally, Moses sought a way to ensure a fair price for tribal fishermen for their catch, and with others, started Muckleshoot Seafood Products, a business that buys tribal fish and sells it to the tribe’s casino and private grocery stores and businesses. Moses continues to serve on the Fish Committee, mentoring the next generation.